My vista install started to crash when there is a lot of disk activity. It would crash every other day at first. Then, at some point it started to go down shortly after I initiate PowerUsenet downloads. I looked at MS documentation for 0x0000007B and concluded that it had something to do with Sata controller. Article suggested to replace cables as it could be caused by a faulty cable but doing so did not help. Then, I bought a HighPoint Tech TocketRaid 1742 PCI card. Documentation suggested to simply install the card and point to the driver location once Vista detected it. Unfortunately, Vista kept on blue screening once card was installed and I could not reach the logon page. I installed the card on an empty PCI slot and connected back my Promise SATA controller. After the Vista came up I installed drivers, shutdown pc and removed the promise controller. Then, I reconnected my SATA HDs to the new controller and succesfully booted. I hope this will end my BSOD issues....Time will show. I tried all North America mirrors to find a fast image download site but I guess because of first day rush, all were slow, download speeds around 50 KB/s. After a couple of hours, I was able to access Georgia Tech mirror which let me download at speeds of 2MB/s, so I got the image in a matter of mins. 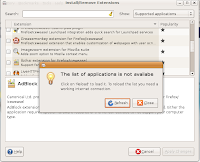 I usually use Lauchpad.net to order my free copies of Ubuntu, which is an awesome feature of Ubuntu Distro. Because of firewall rules, I could not use torrents in my environment. Not sure how that would change my experience. One thing I noticed was that Europe/Asia had a lot more mirrors and when I tried them I got almost the same download speeds: ~50KB/s. I hope more 'fast' mirrors are added for North America soon. Ubuntu installs were always good but not without hickups... When I was reading reviews, I had read something like 'Installation was even easier than Vista'. I attest to that now. I decided to wipe out earlier version and install it on my IBM T40. I popped in the CD, live-cd install completed in a few mins. Then I clicked install shortcut on the desktop and installation started. In all installs up to this version, time would always be incorrect, this worked fine. Install time was short and I had to click 'next' a couple of times to confirm keyboard, regions etc and enter username/pwd. When I say devices, I should confess that I don't really have a lot of devices to check the functionality. What has always been painful for me was Wireless Access. I have a netgear wireless card, which was automatically recognized, drivers were installed and was ready for me to use after reboot. The only thing I noticed was, it was not available during install and at some point Ubuntu install warned me that I did not have internet connectivity, so Security Repositories/Updates would not be available at the time. No biggie. One of the exciting things I saw in 10 rocking features in 10 days series of articles was about Tight integration of Firefox with Ubuntu. So when I browsed to blogger site, firefox popped up a message for "missing plugin". Unfortunately, things did not work as advertised after that. 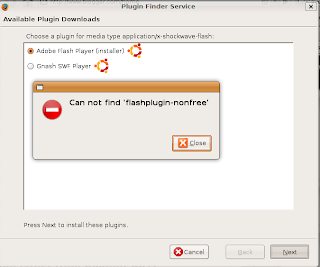 Flash Plugin was supposed to be installed seemlessly. Instead I got an error when I tried to install it. I also tried Firefox > Tool > Addons to install some plugins like GreaseMonkey but no luck there either. It kept on complaining about source not being available. If you look carefully, you will notice a type in "available". I know some may think I am just being picky now, but I hate to see such typos as it gives you the impression of sloppiness. Ubuntu is a 'high-quality' distro, such small stuff does therefore matter (at least to me). I am not sure if this is a bug or if there is some back-end issues here though. Because I also got a "Service Outage" page when I was trying to get some more explanation on what's going on. Anyway, I am sure I can still download and install these stuff manually as I used to. Screen Resolution: It always bothered me with Ubuntu/linux installs not to be able to easily increase screen resolution from current setting. Ok, "easily" is a relative term. Because normally, you would edit /etc/X11/xorg.conf and then logout / log back in to see changes. That's a "no no". In fact, in Ubuntu preview, Lifehacker touched upon this point: "It might not seem like a revolutionary feature, but users can now change their screen resolutions and refresh rates without having to log out or hack around in terminal." I think it should be like in Windows, where all resolutions are listed and when users chooses one, it's tested and user is asked to confirm if it was OK. This is still missing from "easy-to-use" Ubuntu and require a bit more tech skills. Edit 10/22/2007: I am having an issue with Ubuntu start up. It does not start properly and a black screen is displayed. I play with the mouse and touch a few keys, I see HD activity in the meantime and after a minute or so logon screen shows up. I have an ATI card on this IBM T40 laptop, not sure what exactly is causing this but no update has resolved the issue yet. As a Blackberry user, one of my pain-points is with the pst files. Here is how it goes. Let's say Outlook is open and I get an e-mail, my rules process it and move it to one of the pst folders. Problem is that I don't get it in my BlackBerry. Of course, if outlook was closed, or if the rules were not processed, that message would end up in my BlackBerry. As I want to keep outlook open, I have to disable the rules. There is no manual way of quickly doing this. If you look at Outlook Rules > Run Rules, you can not, for example, select all with Ctrl+a. You have to click and select each one of them. Painful! So, I decided to create a macro, that would automatically disable the rules, or enable & run them. Idea is that in the morning, I will keep the rules disabled so that I will get them in my BB, and time to time I will run enable script to move them to psts. and paste the code in there. 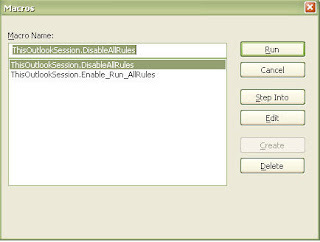 MsgBox ruleList, vbInformation, "Macro: DisableAllRules"
MsgBox ruleList, vbInformation, "Macro: EnableAllRules"
I was looking for a way to create rounded corners without using images. I came across "Nifty Corners Cube" which does exactly that and more.